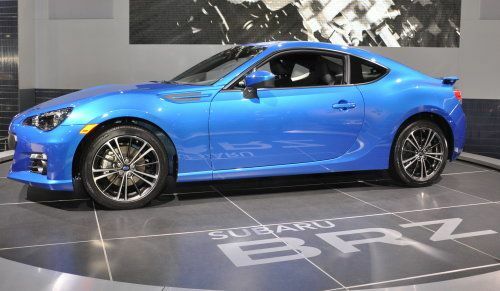 The Subaru BRZ has been shown off in many forms around the world but this week at the 2012 Detroit Auto Show, show goers have a chance to check out the production version of the Subaru BRZ that will hit US streets later this year. The Subaru BRZ was developed jointly between Subaru and Toyota and the end result was a trio of new sports cars that will be sold around the world including the BRZ, the Toyota GT86 and the Scion FR-S. The BRZ is a massive departure from the Subaru sports cars that have helped the popularity of their sporty models – mostly in the exclusion of all wheel drive or a turbocharged engine – but there is no question that the BRZ offers some great looking lines that should sit well with the American car buyer. The production version of the Subaru BRZ is basically identical to the Scion FR-S that will also be sold in the US market with only some minor aesthetic changes here and there. First off, across the front end, the BRZ sports blacked out headlight bezels with integrated amber lenses where the Scion receives chrome units with the amber corner markers located lower in the fascia. The front fascia of the two cars are very, very similar in their overall shape but where the large lower grille opening of the Subaru BRZ has a solid upper section with horizontal bars below, the Scion FR-S has a full “egg crate” style grille opening. Towards the outer edges of the front fascia, the Subaru sports car has shorter openings with a foglight and driving light where the Scion FR-S has only the amber corner marker lights and air duct openings. The side profile of the Subaru BRZ is identical to the Scion FR-S down to the same basic wheel design but the key difference along the side is the upper front fender area. The Subaru BRZ has a (nonfunctional) vent where the Scion FR-S wears a unique chrome badge on a body colored filler piece. Across the back, the Subaru BRZ and Scion FR-S are identical with the exception of the badging and the low profile wing added to the Subaru models. Other than that, the taillights and black lower fascia portions are shared between the Scion and Subaru models. The Subaru BRZ in production form tips the scales at just 2,762 pounds, making it lighter than the Porsche Cayman, the Lotus Evora and the Hyundai Genesis Coupe but with just 200 horsepower and 150lb-ft of torque – it is also less powerful than those other sporty models from around the world. Subaru has long made a name for itself by using forced induction to make big power but the BRZ lacks forced induction...and big power…so it will be interesting to see how Subaru fans respond when the BRZ hits showrooms later this year. The 2012 Subaru BRZ will come with a standard 6-speed manual transmission but those who lack the coordination to drive a manual transmission can opt for a 6-speed automatic transmission featuring a steering wheel mounted paddle shift system. I have to say that the Subaru BRZ is a great looking sports car and while it is an awesome design, it will be interesting to see if 200 horsepower and 150lb-ft of torque will be enough to satisfy Subaru and sports car enthusiasts in the US market where even the majority of modern hybrid models offer more power than the new BRZ. The BRZ, like the Toyota GT-86 and the Scion FR-S, is marketed as a supreme handling car and not a drag racer so the lack of big power might not be an issue but that will be determined when buyers begin getting their hands on the BRZ (and the Scion FR-S) later this year. Check out the gallery on the right for a closer look at the new Subaru BRZ in production form at the 2012 Detroit Auto Show and stay tuned to TorqueNews.com as we continue to bring the best and brightest of the North American International Auto Show! Saw this car in the flesh at 2012 International CES in Las Vegas. It's impressive looking and totally distinct from anything else Subaru sells. I'll be curious to see what it performs like.